In 1859, John Reno helped George Calvin Swadley, William Barranger, and others, dig the Ralston Point Mining Ditch (later called the Wadsworth irrigation ditch). By 1860, more than thirty land claims had been filed in the Ralston/Clear Creek valley by men who came for gold but stayed to develop farms and establish a home. Crops that thrived were wheat, corn, oats, plums, celery, cherries, berries, melons, strawberries, and various vegetables. At one time, Arvada was known as the "celery capitol of the world." Arvada farmers found a good market for their produce in Denver and in hungry mining camps. They had to drive a horse and wagon into Denver City to pick up their mail and to purchase supplies. Their address was "near Ralston's Point" - the high ridge between Ralston Creek and Clear Creek. Benjamin Franklin Wadsworth purchased a land claim in 1863 and by 1869 had moved his family into a primitive log cabin. After the Wadsworth family had settled into their log cabin, Benjamin Wadsworth began to make plans for a school located on his property. He also realized that the Colorado Central railroad, laid from Denver to Golden in 1870, would make a post office possible if a town could be platted and named. 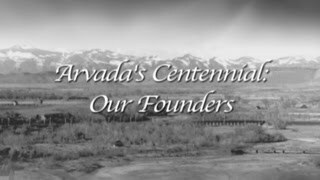 Wadsworth developed a plat for a town of nine square blocks on his 160 acres, and his wife Mary Ann named the new town Arvada after her brother-in-law, Hiram Arvada Haskins. The formal notice of the new town, population 100, was posted on December 1, 1870. Wadsworth applied for a post office and became the first postmaster. Passing trains 'threw off' mail sacks and the Wadsworth family would sort mail into boxes labeled A - Z.
Wadsworth worked tirelessly to attract storekeepers and homeowners to the town. Stores were centered around streets called Railroad (later Grand View) and Centre (later Wadsworth Blvd.) and included a bank, doctors, real estate agents, restaurants, grocery stores, a pharmacy, a hardware store, a blacksmith shop, a livery stable and more.